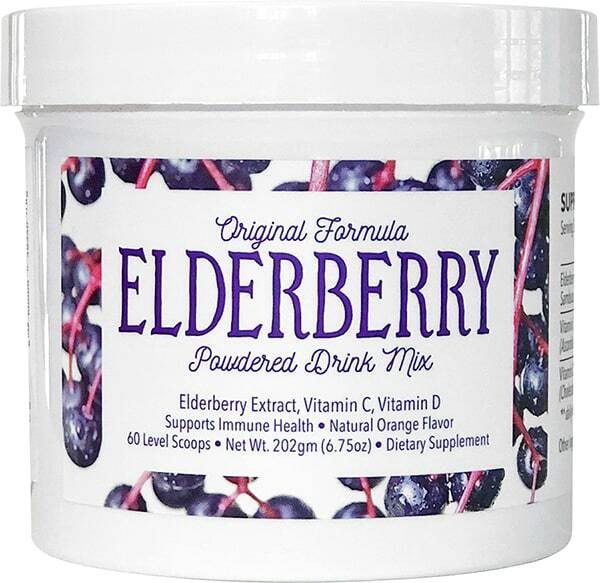 New Elderberry Powdered Drink Mix Available! What is in Elderberry Powder's drink mix? How much of the Elderberry Powder do I to take if I’m not sick? We recommend one scoop per day to boost your immune system. Do I take more when/if I get sick? 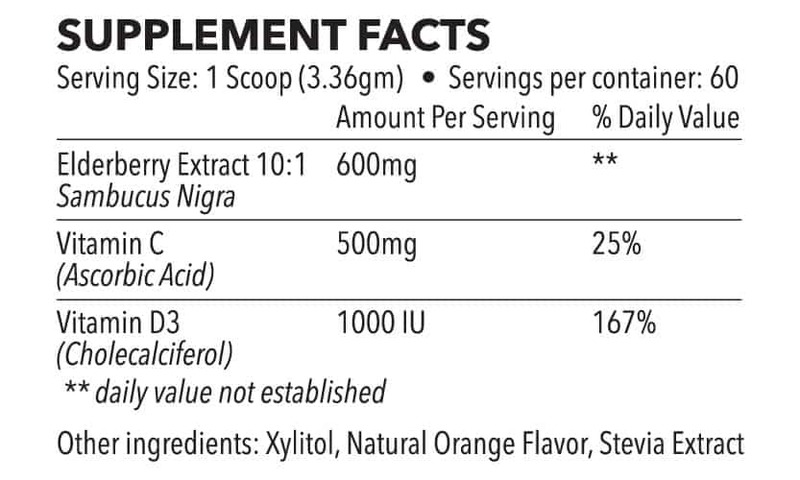 We recommend you take 2-6 scoops per day if you feel sick or have developed flu-like symptoms. What is the best way to take elderberry extract? Gummies, liquid, capsules, tea’s? The most important factor is that you consume elderberry extract on a routine basis. We have found that most people tolerate the Elderberry Powdered Drink Mix the best. The route doesn’t matter all that much, but strength does matter. Our elderberry powder is 6 to 12 times stronger than leading store bought brands. What does Elderberry Powdered Drink Mix taste like? Our drink mix is sweetened with natural sweetners and has a Elderberry/Orange flavor. How is the Elderberry Powder sweetened? Is it safe to take elderberry extract? 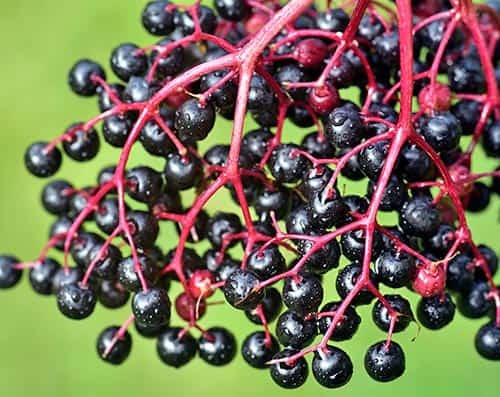 The safety of the standardized Elderberry extract preparation, Sambucus was demonstrated in a clinical study, where it was concluded that this Elderberry extract is safe and can be administered to the whole population, including infants and children. Elderberry Gummies and Capsules Available! How do I get your elderberry gummies or capsules for myself? Call us at (918) 578-0031 and have your order shipped to you anywhere in the state of Oklahoma or we will deliver free of charge within a certain range. What is in NextGenRx’s compounded elderberry gummies and capsules? One gummy or capsule has Elderberry 1000mg, Vitamin C 500mg and Vitamin D 1000IU. How many elderberry gummies or capsules do I take if I'm not sick? We recommend 1-2 gummies or 3-6 capsules per day to boost your immune system. We recommend you take 2-4 gummies or 6-12 capsules per day if you feel like you have been hit with a ton of bricks. What is the best way to take elderberry extract? Gummies, capsules, liquid, teas? It doesn't matter what way you take elderberry, but strength does matter. Our gummies and capsules are 10-20 times stronger than the leading store-bought brands. What does NextGenRx's elderberry gummies taste like? How are the elderberry gummies sweetened? How does elderberry extract fight viruses? Below are summaries of 2 referenced studies discussing the effectiveness of using elderberry extract against the influenza virus. The standardized extract (Sambucol) was also tested in two double blind, placebo-controlled clinical trials. The first consisted of individuals with confirmed influenza B experiencing flu symptoms. Patients were randomized to receive either Sambucol or placebo (a liquid of the same color and texture as the Sambucol) daily for three days. A significant improvement in symptoms, including fever was experienced by 93.3% of the Elderberry treated group within two days. In contrast, 91.7% of the placebo group showed a similar improvement only after day six. Complete cure was achieved within two to three days in approximately 90% of the Elderberry-treated group, and within six days in the placebo group. Higher levels of influenza antibodies were detected in patients receiving Elderberry than those receiving the placebo, suggesting an enhanced immune activity. ~Zakay-Rones Z, Varsano N, Zlotnik M. Inhibition of several strains of influenza virus in vitro and reduction of symptoms by an elderberry extract (Sambucus nigra L.) during an outbreak of influenza B Panama. J Altern Complement Med 1995; 1:361–369. A second clinical trial (conducted by scientists from the University of Oslo) with 60 adults also demonstrated the safety and efficacy of the standardized Elderberry syrup in the treatment of influenza and its symptoms. Patients with either influenza type A or type B were given 15 mL of Sambucol or a placebo four times per day. Treatment was initiated within 48 hours of the onset of symptoms and continued for five days. The global evaluation scores (symptoms and overall wellness scores combined) for the Elderberry-treated group showed a pronounced improvement after a mean of 3.1 days as compared to 7.1 days for the placebo group. A larger number of patients in the control group resorted to a “rescue medication” such as paracetamol as compared to the treatment group. Both studies concluded that patients exhibiting flu symptoms and treated with Elderberry standardized extract recovered significantly faster than patients in the control group. As the authors note in their report, these findings need to be confirmed in a larger study. ~Zakay-Rones Z, Thom E, Wollan T, etal.Randomized study of the efficacy and safety of oral elderberry extract in the treatment of influenza A and B virus infections. J Int Med Res 2004; 32:132–140. You’ll need 20 of the leading competitor's to equal just one of ours. Want more info on Elderberry?